Narcissus juncifolius Salisb. nom. illeg. Narcissus jonquilla (jonquil, rush daffodil) is a bulbous flowering plant, a species of Narcissus (daffodil) that is native to Spain and Portugal, but has now become naturalised in many other regions: France, Italy, Turkey, the former Yugoslavia, Madeira, British Columbia, Utah, Illinois, Ohio, and the southeastern United States from Texas to Maryland. Narcissus jonquilla bears long, narrow, rush-like leaves (hence the name "jonquil", Spanish junquillo, from the Latin juncus = "rush"). In late spring it bears heads of up to five scented yellow or white flowers. It is a parent of numerous varieties within Division 7 of the horticultural classification. 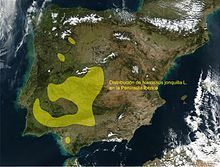 Division 7 in the Royal Horticultural Society classification of Narcissus includes N. jonquilla and N. apodanthus hybrids and cultivars that show clear characteristics of those two species. 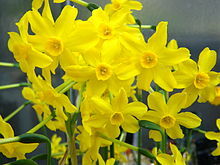 N. jonquilla has been cultivated since the 18th century in France as the strongest of the Narcissus species used in Narcissus Oil, a component of many modern perfumes. ^ a b Nigel Groom (30 June 1997). The New Perfume Handbook. Springer. pp. 170–171. ISBN 978-0-7514-0403-6. Retrieved 28 July 2012. ^ Gordon R. Hanks (18 April 2002). Narcissus and Daffodil: The Genus Narcissus. CRC Press. p. 50. ISBN 978-0-415-27344-2. Retrieved 26 July 2012. ^ "RHS Plant Selector - Narcissus jonquilla". Retrieved 27 June 2013. This page was last edited on 22 March 2018, at 05:55 (UTC).